Got this for my other half, he loves it, real eye opener, learnt a lot more about Islam. Exposes the Koran as a War Manual for Muslims against Non-Muslim faiths,and proves that Mohammed was nothing but a war lord. Excellent book. A must read for anyone wanting to start learning about Islam. Very thoroughly researched book that fully references all of its claims - the 100 page introduction clearly lays out the deceptions about Islam perpetuated by both our Western Establishment Institutions, and Islamic institutions themselves. This is followed by (in their words) "The Chronological Koran," a re-ordered version of the Picktall Koran (standard English version) that is ordered in such a way and with emphasis added in such a way that even a light skimming of this book will clearly lead you to the conclusion that the authors intended - for you to see the central commands of Islam, as taught by Islamic scholars. This book is invaluable in helping to understand the current wave of terror attacks being committed across Europe - attacks in many cases in countries that have had nothing to do with any aggressive actions against Islamic countries (such as Sweden and Spain,) - and gives a worrying insight (if no immediate and significant change in policies are enacted) to what the future of Europe might look like, should current demographic trends continue. Quality explanation with the Koran thrown in for free! Just what I expected, a well written and researched book, that gives a great understanding, in English, and in the true chronological order, of one the most spoke about ideologies. It truly does give you an insight of Islam and its aims. This is an important book for the times we are living in. I also highly recommend Peter's book Easy Meat. Even as someone who has experience with this subject matter - it was a hard read. The truth is sometimes very ugly and disturbing, but not something we should ignore. It doesn't tell any lies and uses the exact scripture of the Koran but in chronological order to show just how anti west & anti non believer Islam is. Commanding violence against those who will not submit to its ideology. I also recommend Tommy's other book Enemy of the State which shows how bad he was treated by the authorities just for trying to reveal the facts about Islam. The overwhelming majority of muslims are not terrorists, however it is a undeniable fact that the overwhelming majority of terrorist attacks are committed by Members of the Islamic faith. 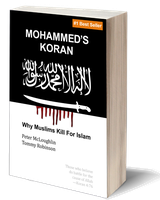 This book states the facts about the written scriptures of Islam that cause this ghastly phenomenon to occur. The longer we fail to address the hatred and bigotry contained within these scriptures towards members of other faiths, the longer we subject the innocent masses of all faiths to further acts of murder and barbarism. All people who value the freedoms and culture, currently found within western peace loving society, need to address why so many followers of this faith are committing these acts on innocent people. To simply lay the blame at the door step of dissolutioned/drug addicted/poorly educated members of society and light another candle is an insult to all those already killed and maimed by there acts and will only perpetuate further attacks in the future. The individuals committing these atrocities are often highly educated scholars of the scriptures of Islam and are not dissolutioned in any way, they are simply following the barbaric instructions of Mohammed as laid down in the Koran in order to secure an eternity in paradise. It is not the individuals interpretation of the Koran that is the problem, it is the Koran itself.To deny this fact is ridiculous and puts in great danger all of our families !!!! A Koran that is NOT in the usually jumbled up and difficult understand format. Instead it allows you to quickly grasp the true and frightful ideology that Islam is; which intends to force its intolerant bigotry on the whole world. Everyone, including all of our M.P. s should be made to read it. So eye opening, a fantastic book! You will blown away in the first 35 pages! It tells you exactly to the point, verse by verse why Muslims kill. A must read MUST read! I urge everyone to read it and learn the REAL TRUTH about Islam !! This book is brilliant an absolute eye opener to the reality of the bulls**t the media and our government would have us believe. Proud not to be a sheep. A well put together book. Clearly a lot of work put into the research. The peaceful bits at the back and how they've been replaced by evil Islam is very interesting. Should be in every school up and down the country. Buy this book and find out why it's got so many brilliant reviews! ...to understand not everybody is raised to believe we are all equal. I bought this book as a fact check. Surely it doesn't preach hatred in a holy book? Yes it does. Surely it doesn't advocate beating your wife? Yes it does. "Fight them" "Slay them" "Strike fear" is a common thread throughout. Nonbelievers are unclean, subhuman and rewarded with the fire of hell! Yes actually. I am holding this book at arms length as it makes for such shocking reading. Married women are a no-no but you can possess slaves so you will be ok! The words of this book can not be argued. Thank you Tommy and Peter this has been a real eye opener as to what is going on in this world and the lies we are blindly being fed by the people who's job is to protect! Seriously, get your copy now before it's banned! This book may one day be viewed as a history changer.